rec. 2016, Koerner Hall, The Royal Conservatory of Music, Telos Centre for Performance and Learning, Toronto. Recordings of music by the Auschwitz survivor Szymon Laks are arriving thick and fast on such labels as CPO and DUX. 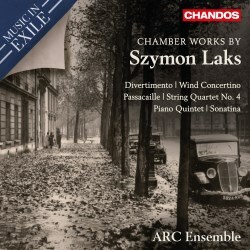 Chandos has now entered the fray, dedicating the third release in their Music in Exile series, devoted to composers expelled by the Third Reich, to Lak’s chamber music. Once again, the Canadian ARC Ensemble do the honours. Previous volumes feature music by Paul Ben-Haim and Jerzy Fitelberg; the latter I reviewed a couple of years ago. Laks was born in Warsaw in 1901 and initially studied mathematics in Vilnius before enrolling as a music student at the Warsaw Conservatory in 1921. He settled in Paris after graduation in 1925 and continued studies with Henri Rabaud and Paul Vidal. He became a founder member of the Association for Young Polish Musicians in Paris. When the Nazis occupied France in 1941 Laks, a Jew, was interned at Pithiviers. A year later he was deported to Auschwitz. In 1944 he was transferred to Dachau, prior to liberation in April 1945. He spent the remainder of his life in Paris. He devoted his energies not only to composing but also to writing books and translating. He died in 1983. The four movement, Gallic flavoured Sonatina, is the earliest work here, composed in 1927. Ravel is a notable influence. The outer movements, animated and intensely chromatic, frame an attractive Scherzino, capricious and light-hearted, with rippling roulades, and a reflective and wistful slow movement. David Louie achieves some luminous colours in his captivating performance. Another early work is the Passacaille of 1945, its melancholy mirroring the horrors of the composer’s internment. Here it is heard in an arrangement for clarinet and piano. The clarinet’s doleful lament is set against the piano’s baroque-sounding accompaniment. All of the other music on this CD dates from the 1960s, with the intervening years constituting a compositionally fallow period for the composer. The String Quartet No. 4 (1962) is set in three movements. The first, dominated by pizzicatos, is jazzy in character, and Laks employs some brilliant effects such as bowing near the bridge to obtain shimmering, glacial sonorities. Calm serenity informs the slow movement, which is followed by a spiky, energetic finale with accented rhythms. The Concertino for oboe, clarinet, and bassoon, from the mid-sixties, will appeal to lovers of Poulenc. Ingeniously scored, Laks’ contrapuntal skill is very much in evidence. Each of the three instruments has its moment in the spotlight. A beguiling slow movement nestles between two movements of a sunny disposition. Two years later in 1967 the composer wrote his Divertimento for violin, clarinet, bassoon, and piano. Again, the mood throughout is upbeat and genial, and the lightly-textured scoring produces some diaphanous effects. The Quintet is the most substantial work, and it’s a 1967 arrangement of the 1945 String Quartet No. 3. Although the original dates back to the time of Laks’ internment years, you won’t find any sombre utterances here. Several Polish songs and dances are brought into play. The slow movement’s ethereal ponderings strikingly contrast with the finale’s genial plucky pizzicato passages. These impressive performances are well-recorded, the Koerner Hall offering warmth and intimacy. Simon Wynberg’s booklet notes provide welcome background to the music.